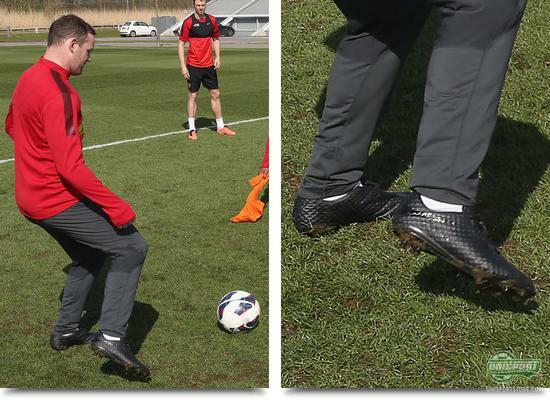 Wayne Rooney and Daniel Sturridge testing a new Nike-boot? We are seeing it on more and more of Nike's attacking profiles  the interesting, blackouted boot, which Danny Welbeck used a week back. 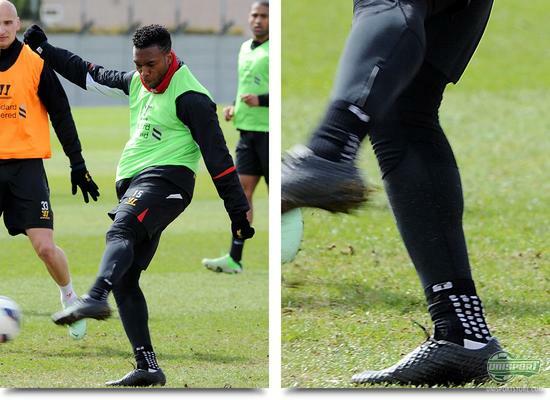 Now it is the turn of Daniel Sturridge and Wayne Rooney, who at the last couple of training sessions with their respective clubs have jumped out of their T90 Laser IV and into the mysterious blackout. 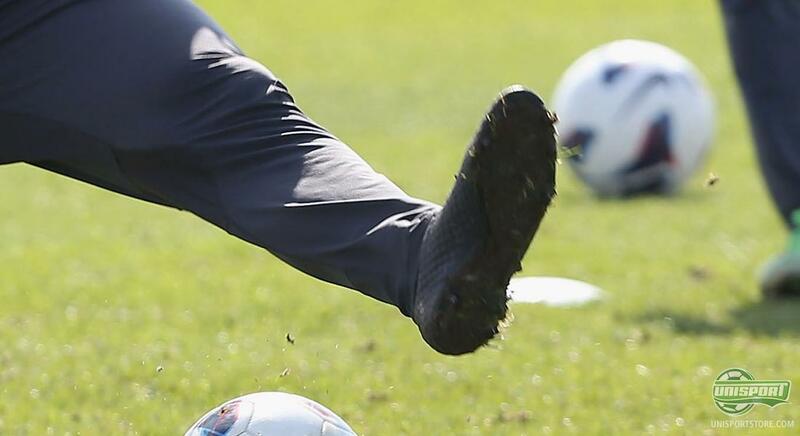 We take a closer look at the boot here. It is the time of the year, where it is a real boot fiesta for spotters around the world. Many of the big brands are testing their coming models, with some of the biggest players and you therefore can already get an interesting sneak peak into the future. With Nike's latest blackout on his feet, Danny Welbeck really sparked the furore around the boot we have already seen both Neymar and the Inter-player Mateo Kovacic testing. It is expected that Nike will focus especially on strikers with this boot and here it is worthy of mention that both Sturridge and Rooney both wear the T90 Laser IV. Should there be a new silo on its way, things are definitely looking exciting. 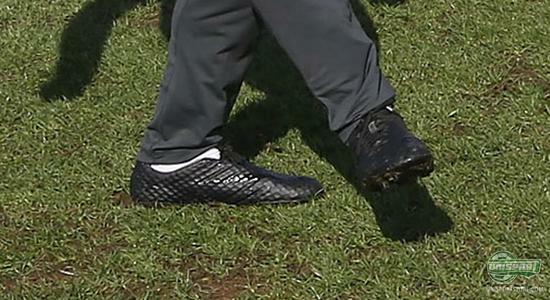 The boots are made with a golfball-like upper, which could look like an even more extreme version of what we saw on the Vapor IX. At the same time it looks like there's a big Nike-logo on both the heel and nose of the boot. The upper looks both supple and thin and is covered in a texture of small dents, which run all over the boot. At the same time we can see from the Sturridge-pictures, that the new model will apparently have conical studs. An interesting choice should things finish like this. It is not just Daniel Sturridge and Wayne Rooney, who have been using the model this week  Neymar also looks to have hopped in the boot at training and the rumours are that he will be the new face of the boot. Wayne Rooney and Daniel Sturridge will undoubtedly not be the last to wear Nikes newest blackout-boots and it will be exciting to see when more news of the boot comes. 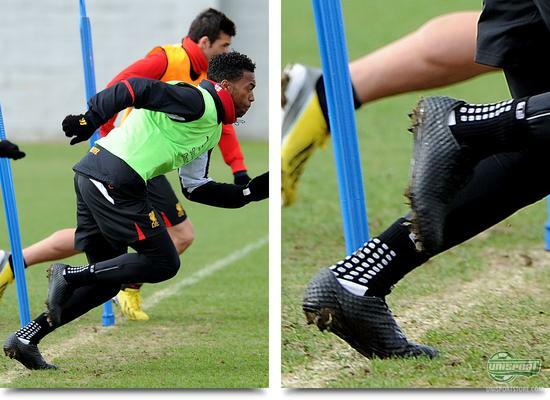 Until then, we would love to hear your thoughts on Sturridge and Rooney's new boots. Does it look good, and who do you think will end up playing in it?